There are many reasons why I love living in western Maine, and the fact that I can walk into Bridgton Books, an independent bookstore, and be handed a book that shop owner Pam Ward thinks I would enjoy is one of them. Pam was so right. 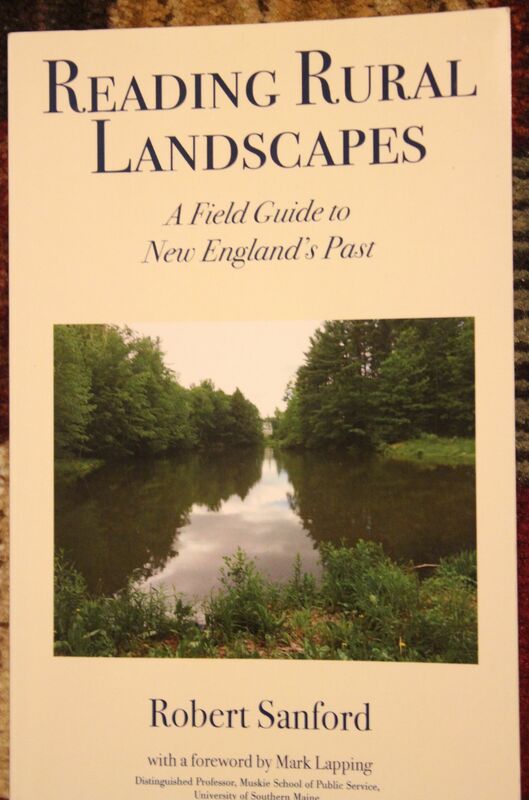 Reading Rural Landscapes by Dr. Robert Sanford, professor of environmental science at the University of Southern Maine, is a perfect follow-up to Tom Wessels book, Reading the Forested Landscape. Sanford takes us one step further in looking at the remnants in the woods. Here in western Maine, I often stumble upon stone walls, barbed wire, foundations, mill sites and other evidence of life gone by. All of this appears in places that seem so far away from civilization. How can it be? Did people actually live in these out of the way places? Why? Sometimes, it’s difficult to imagine that the make-up of the neighborhood was completely different from what we know. We forget that following the Civil War many people left the area for greener fields and less of that good old stone crop. We forget that numerous farms once decorated our landscape. We forget that all the trees we love, didn’t exist. Reading Rural Landscape’s size (5″x8″) means it fits easily into a backpack and has become one of the guides that I often carry. Sanford includes information about plants and trees at homesites, transitions that occur after fields have been used for pasture or agriculture, examinations of house, barn and outbuilding foundations, mill sites and early commerce, indications of rural roads from farming and stagecoach to logging and trolley, the meanings of stonewalls and barbed wire, plus cemeteries and symbols on gravestones. Sanford includes a glossary, chapter notes that are as interesting as the chapters, and an extensive reference section. For $19.95, this is a valuable resource. Ultimately, Sanford encourages stewardship of the land–protection of these historical places. He also encourages us to support those who continue to farm the land and work in the forests in sustainable manners.